We’d love your help. Let us know what’s wrong with this preview of Little Hands Big Hands by Kathy MacMillan. To ask other readers questions about Little Hands Big Hands, please sign up. Early childhood education resource. Great collection of signs for babies/tots and plenty of songs/rhymes for tots/preschoolers. Even if your baby is too young to speak, I tell parents, knowing the basics of how language works will give her a great head start later on, and knowing some basic signs will make communication much less frustrating and interactions more rewarding. I already knew the signs for bathroom and diaper, but now I can also sign 'stinky' diaper. Lots of fun and some new-to-me s Early childhood education resource. Great collection of signs for babies/tots and plenty of songs/rhymes for tots/preschoolers. Even if your baby is too young to speak, I tell parents, knowing the basics of how language works will give her a great head start later on, and knowing some basic signs will make communication much less frustrating and interactions more rewarding. This was a pretty cool book. But you *will* need to get a bit creative to turn some of these ideas into a library program. It seems mostly to be centered around parents and their children. I heard about this book on the ALA website so I did think it was geared towards library workers. What I love is that each subject (family, day/night, colors, etc) comes with book suggestions and crafts that you can photocopy right out of the back of the book. I'm really glad I bought this because I honestly had This was a pretty cool book. But you *will* need to get a bit creative to turn some of these ideas into a library program. It seems mostly to be centered around parents and their children. I heard about this book on the ALA website so I did think it was geared towards library workers. This is a guide for parents who would like to begin using sign language to communicate with their children. 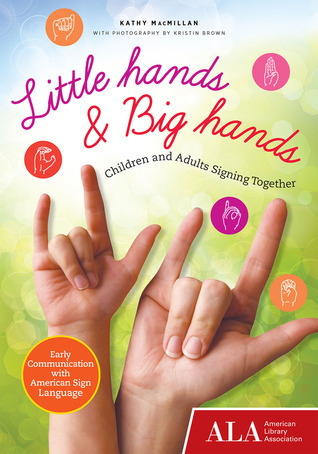 It includes rhymes, crafts and activities, and has helpful pictures of relevant signs for the new sign language learner. Since this is an ALA book I thought it would have more resources for librarians who would like to incorporate sign language into programming, but it's easy enough to adapt the information for parents to be suitable for a library program. Excellent book!! The author presents a basic level of signing options that are appropriate for parents, guardians, teachers, and librarians. Each group of signs is accompanied with several stories that the adult and child can read together while practicing the signs just learned. This book is a home run! Out of all the sign language books I have read this one is my favorite. I will be wearing it out I think as I plan on adding more of this to my story times this year.